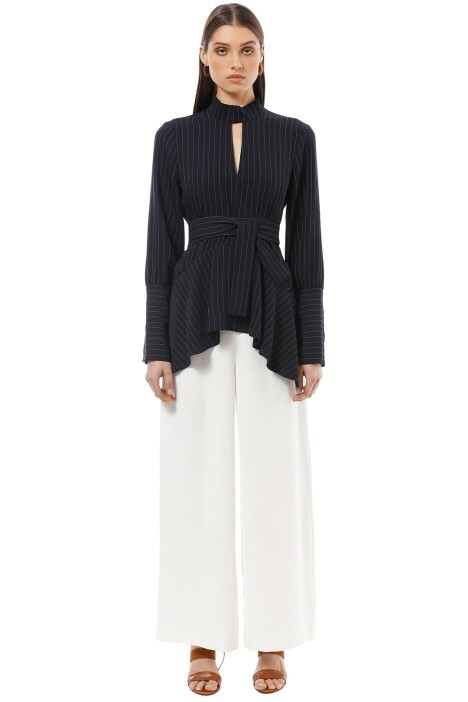 Take a swing at dark and mysterious in this angular pinstriped blouse. A staple for any winter wardrobe, it will enhance your feminine silhouette with a self-tied waist and relaxed fit below the belt. It’s best for a work function on a cold day or your next night out featuring a high neck to protect you from the chill. Wear this modern blouse with a loose pant and sneakers to add a hint of playfulness to your look or style it with a pop of color and a red foldover clutch for added drama. Perfect to hire for your next cocktail party! Check out our blog for more ideas on how you can tweak your chic after work. Pair this with the Anya White Palazzo Pants by Friend of Audrey. WAIST: Fitted with a belt. LENGTH: This top is below-the-hip length. FABRIC: This top has a very slight stretch. Talon Pinstripe Blouse is rated 5.0 out of 5 by 1. Rated 5 out of 5 by Anne from Beautiful blouse for work Looks great with pants or a skirt and even jeans and flats for a casual look. It was a slightly loose fit on me as I am between a size 8 and 10, but I quite liked the look oversized.